I’ve spent today doing quite a bit of cooking. I’ve been loving Pinterest as its helping me explore new recipes and try different foods. What’s weird is that I have a ton of cookbooks that never get used. Lately everything I make comes from the net and usually Pinterest. Today I decided to try a Sriracha chicken recipe and this cheesy creamy potato dish. Am going to have some steamed broccoli on the side, too. For dessert s’mores bars. So while the has taken me a good chunk of the afternoon, I also made several other items to get me through the week. I just love these little pep/pinch bowls. It makes a few extra dishes to wash, but its also nice to have everything pre-measured. 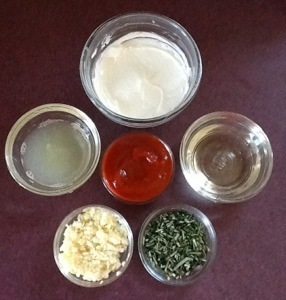 These are the ingredients for the chicken marinade. 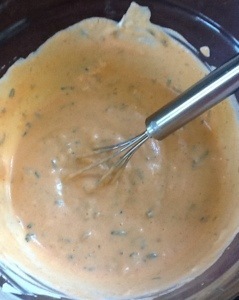 Some oil, Sriracha, garlic, rosemary, lime juice and Greek yogurt. 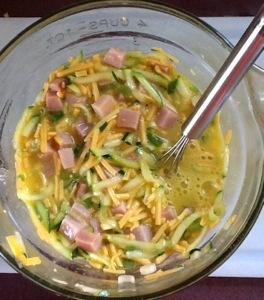 This is the marinade and another of my favorite kitchen items is this handy little mini whisk. If you don’t have one, get one, I probably use this every time I make something. 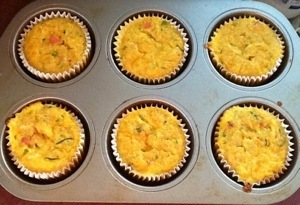 For breakfast, quinoa breakfast frittata type things – baked in a muffin tin. The recipe was for minis but I used my jumbo tin. They look delish, but I’ve not tasted yet. I’ll throw these in the freezer and grab one to take on the go and reheat at work. Quick fast and healthy! It’s no big secret but s’mores are probably one of my most favorite treats. I found this a short time ago and have had it on my mind ever since. 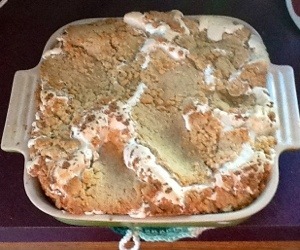 The recipe was pretty quick and easy however one of the main ingredients is marshmallow cream. That stuff is REALLY hard to spread and sticks everywhere. It was a little trying but the end result looks amazing. Can’t wait to try it! Since the breakfast recipe called for quinoa and I’m making another dish tomorrow that uses it I decided to make a big batch. Tomorrow’s dinner is grilled steak, green beans and quinoa Mac & cheese. Obviously there’s no Mac in this but I’m sure the cheesy quinoa will be delicious. It has green onions and garlic in it, so I minced those up and placed in a labelled baggie. I’ll also be making quinoa burgers tomorrow for a reheat quick supper this week. Again, the quinoa is already prepared, I shredded the zucchini, onions, garlic etc and placed em in labelled baggies and will throw that together tomorrow. So my next couple of meals will be very quick and easy. And if you sense a quinoa theme here you are quite correct. It’s my new super food. It seriously goes with everything. It took me a bit to get used to the taste but now that I have I’m totally subbing it for anything that uses rice. Last weekend I made a cheesy broccoli quinoa recipe that I loved. You can serve it hot or cold,sweet or savory. It’s so versatile and the texture is more pleasing to me than couscous. By the way it’s a great source of fiber and protein. I’m on the lookout for new quinoa uses so if you have them, please share! Ps all recipes discussed here are on my Pinterest food or dessert board.